I am a really big fan of indo-chinese food, whereas 'he' prefers mughlai or authentic bengali food more. Before marriage, I used to find excuses to go to any restaurant and eat 'chilli chicken' with rumali roti. I know what are you guys thinking. But don't know why I love this combo so much. In every street of Kolkata you can find various indo-chinese restaurants. 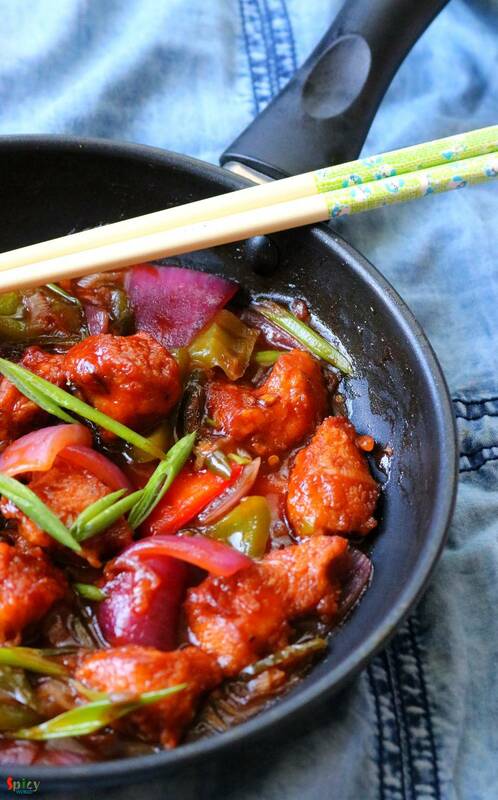 I mentioned Kolkata style because they make this chilli chicken on a little bit of dry side and also extra spicy. You can also serve this as starter. 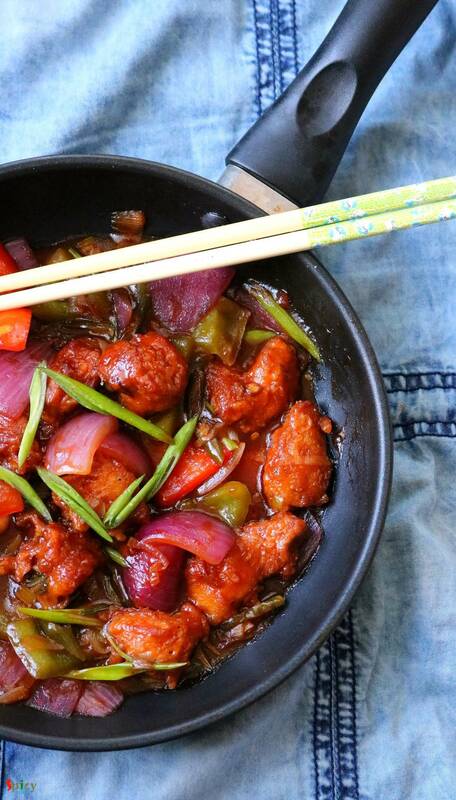 Try this easy chilli chicken recipe in your kitchen and enjoy with your family. 300 grams of boneless chicken cubes. 1 onion, cut into chunks. 1 Tablespoon of chopped garlic. 4 Tablespoons of soy sauce. 2 Tablespoons of chilli sauce. 1 and half Teaspoons of red chili powder. 2 Teaspoons of black pepper powder. 1 Tablespoon of fresh ginger, garlic and green chili paste. 3 Tablespoons of chopped white part of green onion. 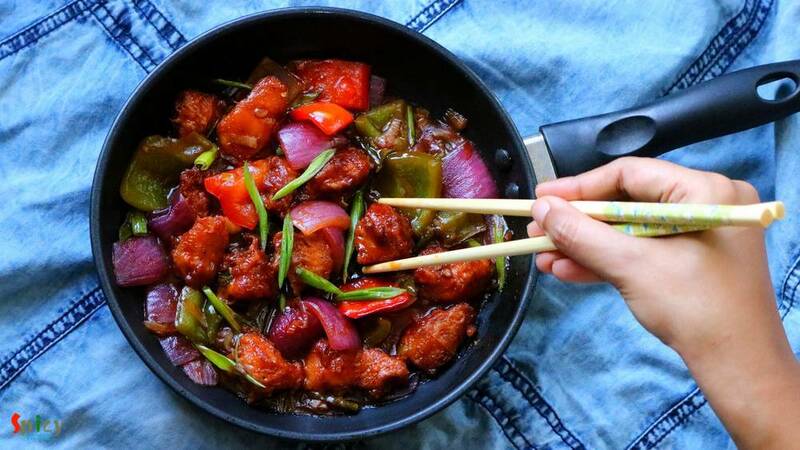 Marinate the washed chicken pieces with salt, red chili powder, black pepper powder, 2 Tablespoons of soy sauce, vinegar, ginger garlic and green chili paste. Mix well and let it rest for at least 1 hour. In a mixing bowl, add the remaining soy sauce, ketchup, chili sauce and oyster sauce. Mix with a spoon. In another bowl add 1 Tablespoon of cornflour and 3 Tablespoons of water. Mix very well and add this to the sauce mixture along with chopped green chilies. Mix well and let it rest for 20 minutes. Add the remaining cornflour and an egg into the marinated chicken. Mix well with your hand. Heat 2 cups of oil in a kadai / wok. Gently drop the chicken pieces into the hot oil. Do not over crowd the pan. At a time 7-8 will be good. Fry them for 3-4 minutes. Fry rest of them in the same way. Take them out in a tissue paper to absorb excess oil. For the gravy, heat 2 Tablespoons of oil (in which we have fried the chicken) in another pan. Saute chopped garlic for few seconds. Then add white part of green onion and fry for few seconds. Next add onion and capsicums. Fry on high flame for 2 minutes. Then add the sauce and cornflour mixture. Mix well for 2-3 minutes. Add 4-5 Tablespoons of hot water and cook for a minute. After that add the fried chicken and mix for a minute. Sprinkle some salt and pinch of sugar for the seasoning. Mix well. Lastly add sesame oil and chopped green onion, mix well and turn off the heat.